It often feels to me that a disproportionate share of the discussion talk about environmental issues involves arguments over the risks of climate change, which in turn are built on models of how climate, economic, and political forces will evolve over the next century. But the environmental movement has had its biggest effect when the harms were immediate. "So Earth Day 1970 was just one of many dark and dirty days in Chattanooga, a city in which the mid-'60s death rate from tuberculosis was double that of the rest of Tennessee and triple that of the rest of the U.S., a city in which the filth in the air was so bad it melted nylon stockings off women's legs, in which executives kept supplies of clean white shirts in their offices so they could change when a shirt became too gray to be presentable, in which headlights were turned on at high noon because the sun was eclipsed by the gunk in the sky. Some citizens could actually identify different sections of town by nose alone—a stink of rotten eggs in one place, acrid metal in another, coal smoke in another, the pungent smell (and orangish haze) of nitrogen dioxide near the VAAP [Volunteer Army Ammunition Plant]. One part of town, site of a city dump, was known simply as Onion Bottom. People joked, "We like to look at what we're breathing before we inhale it." A billboard appeared bearing this alarming question: DEEP DOWN INSIDE...WOULDN'T YOU RATHER BREATHE CLEAN AIR? Anyone who has lived in Chattanooga for a while has memories of what the old air did. Linda Harris, local chairman of Earth Day 1990 and acting director of the Chattanooga Nature Center, recalls her childhood: "Our eyes stung, and our noses itched. The milkman left milk in bottles at dawn, and when we brought them in a couple of hours later, we could write our names in the dirt that had collected in the moisture on the bottles." Wayne Cropp, director of the Chattanooga-Hamilton County Air Pollution Control Bureau, says, "You could always tell which way the ammo plant was by looking at the bushes in that part of town: The side away from the plant grew green, and the side toward it was brown." Fry recalls, "As a boy, I had a morning paper route. I delivered before daybreak. If I had a cold, my nose would be running black by the time I got home." Remember, this isn't a description of coal smoke back in Victorian England in the mid-1800s. It's a US city less than a half-century ago. "Diseases caused by pollution were responsible for an estimated 9 million premature deaths in 2015—16% of all deaths worldwide—three times more deaths than from AIDS, tuberculosis, and malaria combined and 15 times more than from all wars and other forms of violence. In the most severely affected countries, pollution-related disease is responsible for more than one death in four. Pollution disproportionately kills the poor and the vulnerable. Nearly 92% of pollution-related deaths occur in low-income and middle-income countries and, in countries at every income level, disease caused by pollution is most prevalent among minorities and the marginalised." Here's some additional detail. 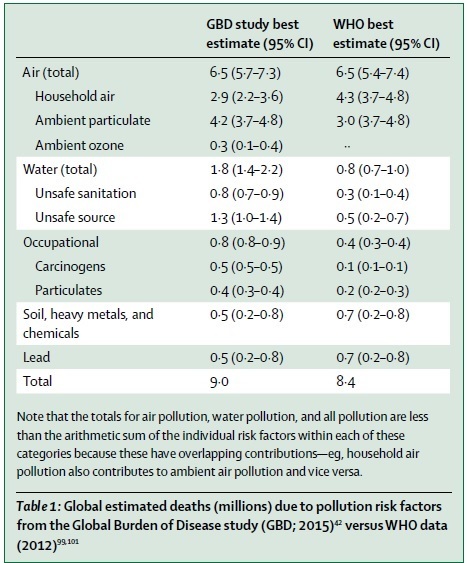 This table presents results of two earlier studies of the mortality effects of pollution, the Global Burden of Disease study and a study from the World Health Organization. The studies suggest that roughly 8.4-9.0 million people die each year from pollution, and air pollution in particular is the major culprit. The report offers considerable detail about each type of pollution. Putting a monetary on these damages is difficult, and there are a number of approaches. For example, some focus on health care costs and lost productivity. Separating out costs from pollution from other causes of health problems is tricky. Others try to take into account what people might be willing to pay to reduce their risk of early death by a certain percentage amount. Costs like the actual pain and suffering experienced by those who are ill, or by their relatives and friends, are often left out of the picture. But with concerns duly noted, one set of estimates suggests that the costs of pollution might be about $4.6 trillion, or equal to about 6.2% of global national income. For someone with an academic mindset, like me, it always seems like tables showing millions of deaths and trillions of dollars in costs should be an electrifying call to citizens and policy-makers. But of course, most normal human beings don't quite think that way. Most people react more strongly true anecdotes, like the nylon stockings melting on women's legs or noses running black. A report like the Lancet Commission can publish estimates, but the task remains for others to translate tables of numbers into momentum for action. And for those who want to make sure that climate change remains in the conversation, it's worth remembering that reducing many of the policies to reduce emissions of carbon and other greenhouse gases would also have near-term benefits in terms of improved public health. This is sometimes called the "co-benefits" approach The Lancet report is focused on current costs of pollution, but it does note in passing: "The annual marginal benefits of avoided mortality from reductions in air pollution that will result from greenhouse gas mitigation strategies are estimated to range from US$50–380 per ton of CO2 abated, and are projected to exceed marginal abatement costs in both 2030 and 2050." I would re-order the thoughts in that sentence. The Lancet Commission is saying that steps to reduce climate change would pay for themselves in terms of avoided mortality in air pollution. Thus, how about focusing on steps to reduce air pollution can save lives in a cost-effective manner--and let the additional benefits of reducing carbon emissions just be icing on the cake?